Bottle gourd is a vine grown for its fruit, which can either be harvested young and used as a vegetable, or harvested mature, dried, and used as a bottle, utensil, or pipe. For this reason, the calabash is widely known as the bottle gourd. 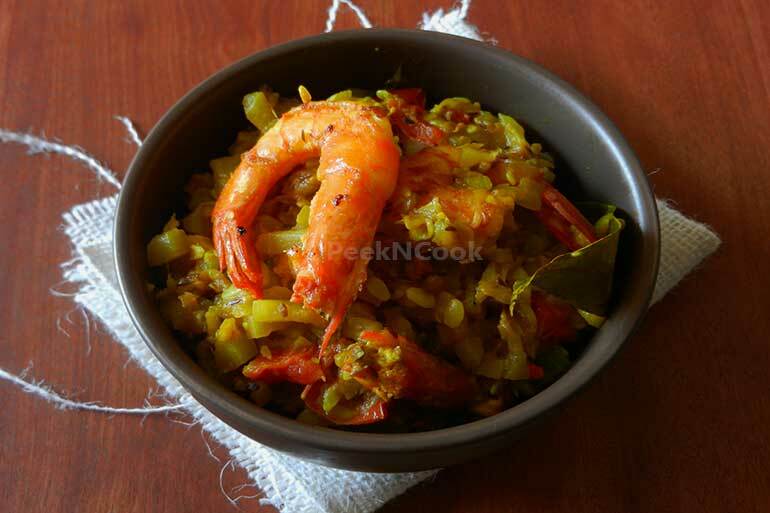 Here Is the recipe of famous Bengali Lau Chingri Or Bottle Gourd with Prawn recipe. Marinate prwans with salt & turmeric. Heat oil in a pan and lightly fry the prawns and take them out and put in a bowl. In the same oil add bay leaf, green chili, cumin seeds and fry for a while. Now add the chopped bottle gourd, turmeric & salt and cover it with a lid and simmer the stove. After 20 min open the lid and check if the bottle gourd is cooked or not. If It is cooked add chopped tomatoes, fried prawns & sugar and higher the flame and stir fry it. When all the juice which came out from bottle gourd is evaporated off the stove and serve the lau chingri with steamed rice. Before serving you can garnish the curry with handgull of chopped cilantro.